1-button programmable keypad with status LED for feedback. 2-button programmable keypad with status LEDs for feedback. Sivoia QED keypad features standard engraving. Raise and lower shading system to any level. Includes status LEDs for feedback. Sivoia QED keypad features standard engraving. 3-button programmable keypad with status LEDs for feedback. Sivoia QED keypad features standard engraving. 3-button programmable keypad with status LEDs for feedback. 3-button programmable keypad with status LEDs for feedback and raise/lower for fine-tuning. Sivoia QED keypad features standard engraving. 4-button programmable keypad with status LEDs for feedback. 4-button programmable keypad and off with status LEDs for feedback. 4-button programmable keypad and off with status LEDs for feedback. Includes raise/lower buttons for fine-tuning. 4-button programmable keypad and off with status LEDs for feedback. Includes raise/lower buttons for fine tuning and IR receiver. Sivoia QED keypad features standard engraving. Coordinates lighting for up to 4 movable walls (5 rooms). 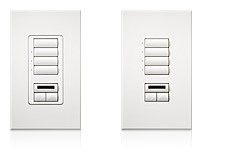 Each toggle button is setup to operate the control units associated with a movable wall. 5-button programmable keypad with status LEDs for feedback. Includes raise/lower for fine-tuning. Sivoia QED keypad features standard engraving. 6-button programmable keypad with status LEDs for feedback. 6-button programmable keypad with status LEDs for feedback. Includes raise/lower for fine-tuning. Sivoia QS keypad features custom engraving. 7-button programmable keypad with status LEDs for feedback. Features 2 groups of 2 programmable buttons with status LEDs for feedback and standard shade engraving. 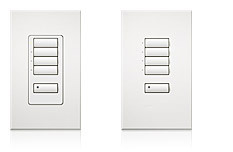 Features 2 groups of 3 programmable buttons with status LEDs for feedback and standard shade engraving.